Why not sew yourself a dress or several! This book includes patterns for ten wonderful dresses. Dress Factory for Grown-ups is a handicrafts and pattern book for successful sewing moments. It continues on the path of the immensely popular children’s Dress Factory (rights sold to Estonia, Germany and Korea), but this time the dresses are designed for adults, and come in a range of women’s sizes. This sewing book provides stunning outfits for both casual and formal events. The clear designs in the patterns accommodate many tastes—from easy summer dresses to more demanding creations. 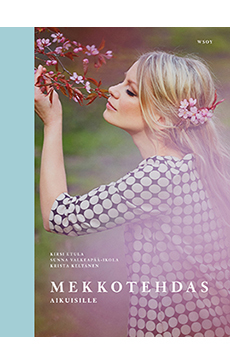 The book contains patterns for ten women’s dresses (sizes 34-46/6-18/S-XL) and one pattern for a girls’ dress. The book also includes ideas and instructions on customising patterns, tips for the more challenging tasks and advice on fabrics and materials. The book also incorporates instructions for making a make-up bag, a beach tote, scarf with tassels and wrist warmers.